My amazing wife & business partner, @GracefulJill, and I arrived on campus at FIU today just in time to get a great parking spot and jump in the registration line. Right away, the #WCMIA team showed that they had done a great job getting things organized—the registration line ran smoothly, and we got some great event swag. We planned to divide & conquer, but ended up both catching the session “How to Keep a Client Happy” by Christina Siegler on the Content & Design track. After that session, I snuck over to the Development track to hear a couple of more technical sessions, and Jill stayed for more Content & Design goodness. She spoke very highly of the session with Michelle Schulp on “Becoming The Client Your Developer Loves”—so much so that I’m planning to catch the recording. In “Writing Multilingual Plugins and Themes,” John Bloch didn’t shy away from tech issues, and he dug right into code samples while explaining the concepts around internationalization (“I18N” for short). Then I caught Chris Wiegman, whom I’ve gotten somewhat acquainted with since he relocated to paradise Sarasota a little over a year ago. He’s known as an expert in WordPress security, and his “Application Security For WordPress Developers” was entertaining, informative, and thorough… not to mention somewhat over my head in spots. On my way to the Development track, I bumped into Pam Blizzard, one of the organizers of the WordPress community in Sarasota. I’ll try to come back and fill in more about our experience as time permits! There was an authentic, vulnerable talk on getting the most out of the WordPress community from Marc Gratch. He shared some very personal experiences (that I’m sure many of us can identify with) about working alone & working remotely, and how the amazing WordPress community can be a great support system. 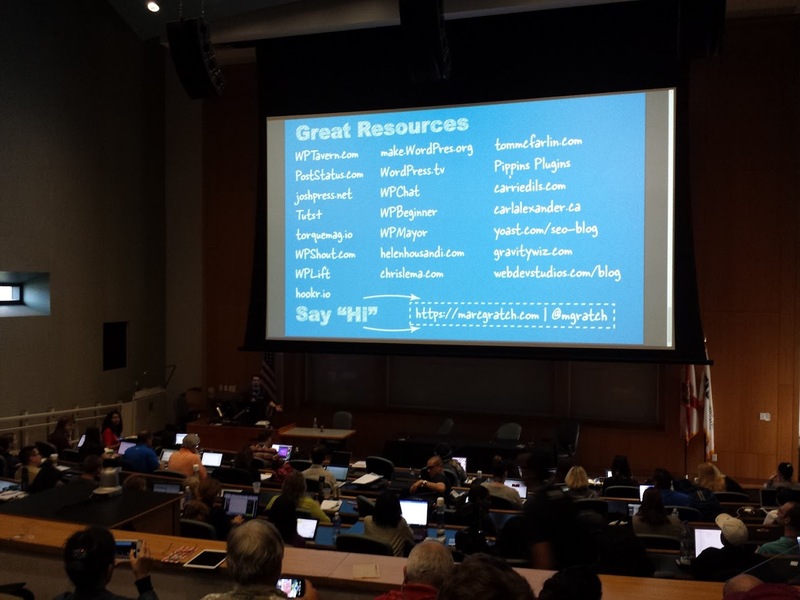 Then a fast-paced session on building a 6-figure email list with Syed Balkhi, creator of Opt-In Monster, WPBeginner, and many other sites & tools. Nile Flores did a thorough, informative session on Yoast SEO, but managed to cover quite a bit of “SEO basics” ground in the process. This session should be mandatory for site owners who are new to how Google’s search results work and need a nice overview. Then I caught up with Jill and we got some great lessons from Dr. Anthony Miyazaki about what is an acceptable number of times to dip your chip into the guacamole. He showed how you have to plan ahead so that you have enough of your chip left to really maximize your dip.